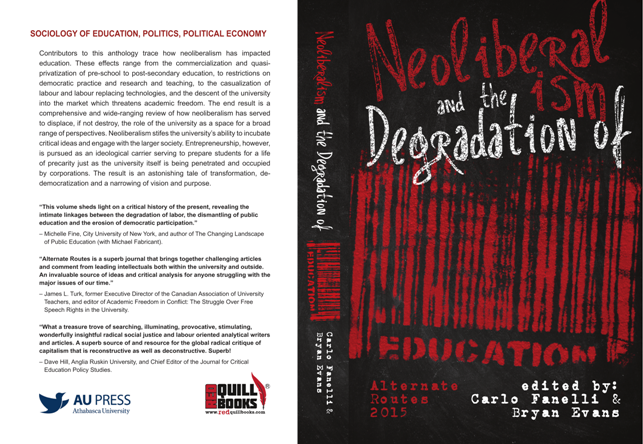 Contributors to this anthology trace how neoliberalism has impacted education. These effects range from the commercialization and quasi-privatization of pre-school to post-secondary education, to restrictions on democratic practice and research and teaching, to the casualization of labour and labour replacing technologies, and the descent of the university into the market which threatens academic freedom. The end result is a comprehensive and wide-ranging review of how neoliberalism has served to displace, if not destroy, the role of the university as a space for a broad range of perspectives. Neoliberalism stifles the university's ability to incubate critical ideas and engage with the larger society. Entrepreneurship, however, is pursued as an ideological carrier serving to prepare students for a life of precarity just as the university itself is being penetrated and occupied by corporations. The result is an astonishing tale of transformation, de-democratization and a narrowing of vision and purpose.